This picture frame clock is a one-of-a-kind quartz wall clock. Overall it measures 8" by 6" and the paper dial states Westclox. Brand new quartz movement and a new battery. 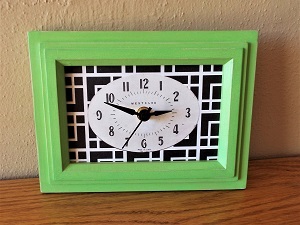 Repurposed mod wood frame compliments the oval reproduction paper dial with black and white geometric patterned background. 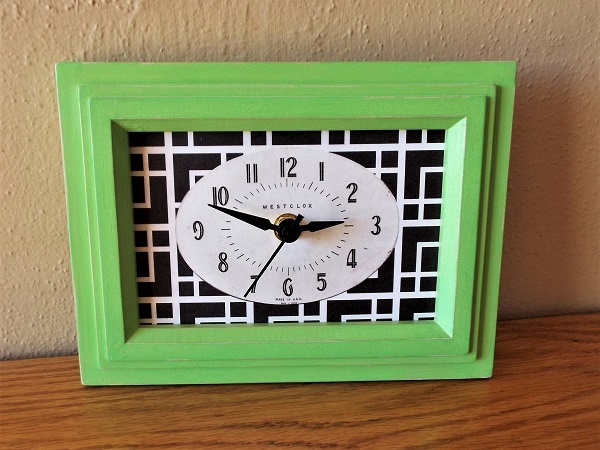 Repurposed antiqued bright green frame. Has a continuous sweep quartz movement with a black minute, hour and second hand. No ticking noise. Would make a fun gift.